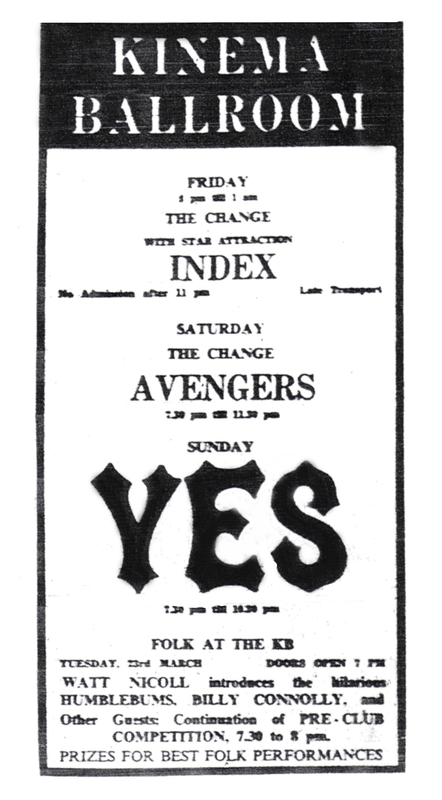 This was my first experience of Yes. I was still at school and had formed a band with friends playing an "interesting" mix of cover tunes. This gig turned us round and we immediately started writing more of our own material with as much Yes flavour as we could manage. The gig is still vivid - Steve sitting down because he had so many pedals, Chris' amazing bass solo, Bill's technique, Tony Kaye's flying jacket (! )and Jon effortlesly reaching those high notes. The band had, I recall recently bought Iron Butterfly's PA system so the sound was amazing; I had seen Led Zeppelin, The Nice etc but this was the first time you could hear everything so clearly. The venue was unseated, entrance 10 shillings (I think), and everyone started sitting, hippily, on the floor. The "light show" consisted of two colours - red and green - and the roadies communicated with flashed torches but we were very impressed. Anyone got any pictures or a bootleg of this show?? ?